In 2-quart saucepan, mix 1/2 cup sugar and the cornstarch with whisk. Gradually stir in coconut milk. Cook over medium heat 7 to 12 minutes, stirring constantly with wooden spoon, until mixture thickens and boils. Boil and continue to stir constantly 1 minute longer. Remove from heat; stir in vanilla. Place banana slices in single layer over baked crust. Pour warm filling over bananas; spread evenly to cover banana slices. Cool at room temperature 15 minutes, then cover filling with plastic wrap. Refrigerate at least 2 hours until set. When ready to serve, remove plastic wrap from filling. 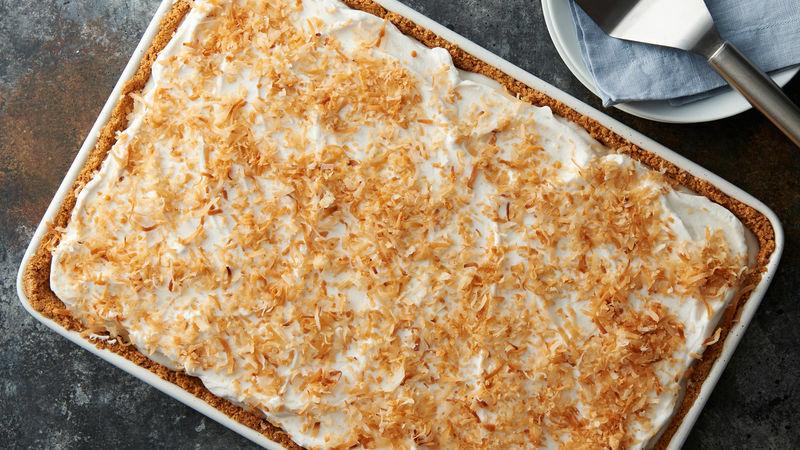 Spread coconut whipped topping evenly over top of chilled filling. Sprinkle with toasted coconut flakes. Store loosely covered in refrigerator. Cooking Vegan? Always read labels to make sure each recipe ingredient is vegan. Products and ingredient sources can change. This recipe is best made the day it is to be served. To toast coconut, bake uncovered in ungreased shallow pan at 350°F 5 to 7 minutes, stirring occasionally, until golden brown.